Munchkin Starfinder preorders close on Friday, January 12, and with them, your last chance to reserve the game until it comes out later this year. Preordering ensures your copy will be shipped when we ship Kickstarter backer rewards, in summer 2018, well before it releases to the general public! The I Want It All Box is stacked with Munchkin Starfinder goodies, including the core game, Munchkin Starfinder 2, the Star Field board, a Starfinder Kill-O-Meter, metal Credsticks, a dice pack, The Swarm mini-expansion, the Hero Pack mini-expansion, and the Space Goblins mini-expansion, which is exclusive to this box. Not to mention the extra bookmark and certificate . . . it's a veritable treasure chest of space loot! In addition, you can add more copies of the game or add-on to your order; it's a perfect gift. Or you may just want to hoard Credsticks, which is understandable; they are hefty littly chunks of metal that can double as props for your Starfinder RPG game! If you want a peek inside, make sure you like our Facebook page, and you may get an up-close view of all the goodies packed in the box. Again, preorders close on Friday, so make sure to preorder soon. 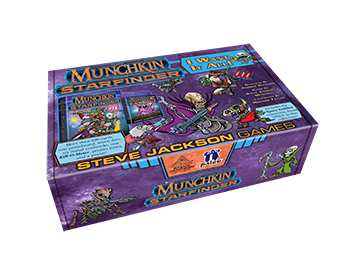 Look for Munchkin Starfinder to start hitting backer and preorder mailboxes in May 2018!